The stimulus package that passed in the House -- without a single GOP vote -- yesterday is not as forward thinking as it appears, despite what Nancy Pelosi said in a news conference. "This is a bill about the future," Pelosi said. "It is a bill that will guarantee that we will create jobs, that there will be good paying green jobs that will transform our infrastructure, transform our energy and how we use it and our dependence on foreign oil." * $6 billion for ready-to-go sanitation infrastructure projects. But the Bill doesn't go far enough, according to some critics, in support of public transportation, including light and high speed rail. Others, however, do point out that transit is one of the larger ticket items in the green portion of the package. The Sierra Club praised the House Bill, noting that clean energy spending is at $100 billion. But "the bill isn't all green," according to other critics, and the Senate is apparently putting $4.6 billion for coal and $50 billion for the nuclear industry. *$1.6 billion for carbon capture at industrial plants. I'd like to see some investment in such R&D for coal, as it remains the most plentiful resource we've got domestically and comprises such a high percentage of our energy needs today. If we can figure out how to clean it, capture and store it or just reduce its impact, I'm all for it. And, as for nuclear, I still maintain it needs to be part of the mix. Another source of criticism of the House Bill may be remedied in the emerging Senate version, which would adjust the alternative minimum tax (ATM), thereby holding down many middle-class Americans' income taxes for 2009. President Obama's administration has said it would ultimately accept an ATM provision, which may go a long way towards giving the Senate Bill legs. Compromise and consensus may be the key to the Obama presidency. But with so many other programs stuffed into this StimPack, including many traditional Dem favorites, it's hard to see the future: so much in here looks like the past. Investing books run the gamut from bad to Mad and from the solipsistic to the sophomoric. Most are wasting your time with hackneyed investing tips ("buy low; sell high") or the author's idea of the latest hot stocks. Such books seem designed to get you to watch the author's nightly TV show or to buy their next book. 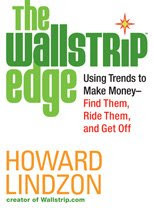 "Noise is the investor's worst enemy," Howard Lindzon says to open his book, The Wallstrip Edge: Using Trends to Make Money -- Find Them, Ride Them and Get Off. "It leads to fear, anxiety, and countless investing mistakes." Lindzon tells his readers to turn off the TV, stop reading the financial headlines, and to ignore hot tips from friends, family, or your neighbor's dog. Rather, Lindzon, creator of Wallstrip.com the web-based video program that mashed pop culture and the stock market, offers an alternative approach. It's a simple premise: stocks that have hit an all-time high and are showing signs of growth are likely to go up before they go down. For many, this is counter-intuitive: how can what appears to be an expensive stock be a good bet for an investment? Why don't I just buy a lower priced stock so I can buy more shares? Lindzon suggests that jumping on a trend on the way up, riding it until it begins to show signs of slipping, and managing your price threshold can lead to greater success than traditional approaches to stock market investing. He's a good writer, as readers of his popular blog are aware. And he has as much fun at his own expense as a stand-up comedian. But don't let the class clown image fool you, Lindzon is a smart investor and business man with a string of successes, Wallstrip and Golf.com among them. His latest venture, StockTwits, builds on his own advice to connect to and leverage a network of people you trust to help you stay on top of trends, creating conversation rather than noise. And staying on top of trends is important in today's rapidly changing investing landscape. The trouble with many investing books is that things are changing so fast that what is a high-flying stock when the author is writing may have tanked by the time of publication. Certainly you can point to some of the stocks Howard Lindzon discusses in The Wallstrip Edge and say the same thing. Actually, even Wallstrip is no more; CBS, which bought the property from Lindzon in 2007, recently pulled the plug on the program. But Lindzon suggests it's not about individual stocks, but the opportunity and, if you stay focused on the all-time high list, you'll always find an opportunity. The glass is half full and new trends always emerge. You simply need to pay attention. Sound advice from a seasoned pro. And worth the price, which by the way costs about as much as a share of $CBS stock at its 52-week high. Pew Research Says "It's Still the Economy, Stupid"
The Pew Research Center for the People & the Press released a report yesterday stating that the economy was the number one policy priority according to Americans they surveyed. By far the economy and jobs top the list. The share of Americans saying that strengthening the nation’s economy should be a top priority has risen from 68% two years ago to 75% last January to 85% today. Concern about jobs has risen even more sharply. The 82% who rate improving the job situation as a top priority represents a 21-point jump from 61% a year ago. The environment and global warming are among the laggards at the bottom, with global warming dead last. What does this tell me? It confirms that the new green economy has to be about making money and creating jobs and get beyond global warming. The Pew Research Center for the People & the Press is one of seven projects that make up the Pew Research Center. The Center is supported by The Pew Charitable Trusts. My friend Shari Shapiro, one of the smartest green people I know in the legal community, has an excellent new post up on GreenerBuildings.com (the post originally appeared on her own blog Green Building Law). Long the city of high crime, poverty and neglect by the federal government which calls it home, Washington D.C. has passed some of the most progressive sustainability regulations in the country since 2006. For example in December 2006, Washington mandated, among other things, that private buildings 50,000 square feet or larger have to submit a checklist of green features by 2009, and meet LEED NC 2.2 standards by 2012. In addition to green building regulations, Washington has enacted comprehensive sustainability legislation, including a Clean and Affordable Energy Act, a Green Summer Jobs bill, a Climate Initiative and stormwater and water quality regulations. Shari also had a great critique of the Obama Stimulus Package earlier this week: Shortchanging the Environment. I'm not an Obamaniac. I am hopeful about the prospect of our new president, but I get nervous about all the messianic talk surrounding Mr. Obama during and since the election. Today, I am ever proud to be an American. For what electing Mr. Obama says about ourselves, our values, our country, and our ability to be forward thinking, to reinvent America. And I am hopeful that in reinventing America we can get the new green economy kick-started under Mr. Obama's leadership. As I wrote a couple of weeks ago on this blog, "I hope Mr. Obama isn't setting himself up for failure by trying to bring a compromise to the table before the table has been set or by biting off more than he can chew before dinner is served." The coming weeks will tell. Tonight, I offer our new president my congratulations and admiration. I continue to be impressed with how he brings people together -- conservatives and liberals alike. Tomorrow, however, is the time to begin turning all the talk into action. So that one day we can say "Yes, We Did...when it mattered most." Michael Ferrari On "Anticipating the Climate Black Swan"
"Contemporary economics, short-term thinking, and the need to quantify and compartmentalize our ideas in order to make sense of them, all serve to remove the 'gray area' from our sense of reasoning; unfortunately, the gray area is the source material from where the highest potential for discovery lies. Saying all swans are white was correct, until the first documentation of a black-colored species. Previous models become useless, and the world view changes in an instant. Extending this to other areas of contemporary markets, most of the major financial risks were assumed to be properly hedged, until the recent collapse of the banking system. Weather has these Black Swans too. It follows that blindly assuming continued warming climate trends will lead to the observation of slightly warmer temperatures year over year may work for a while, until a cold snap like the one that hit the eastern US at the beginning of last winter produces one of the coldest starts to winter in many years." Twitter is an amazing animal. 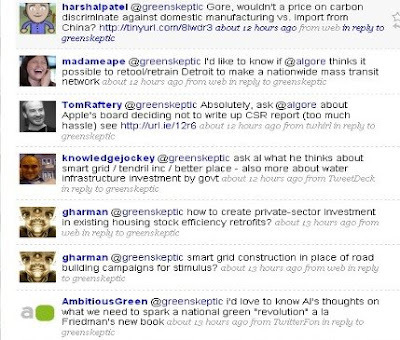 Yesterday, before heading to a meeting with Al Gore, which I wrote about last night, I decided to ask the Twitterverse what they wanted me to ask him. Pretty cool to have such a quick response from the Twitterverse. Thanks to everyone who responded. In the end, I got to ask one question of Mr. Gore and I went with, "Do you think it is possible for traditional industries, such as the auto industry to adapt and change for the new green economy?" His answer? "Many of us wish they had done so years ago instead of giving Toyota a 7-year lead in hybrid drive-train development," Mr. Gore said. "But I do think there are plenty of opportunities for industries to get on board now -- and those that see it will do so; those that don't will be gone." Perhaps Mr. Gore will visit the green skeptic and tackle the questions above in Disqus comments, assuming he is a Disqus user. Image by World Economic Forum via Flickr"Short-term thinking has led to the climate crisis, just as it has led to the financial crisis," Al Gore told the group of us gathered at PNC Bank in Center City Philadelphia this afternoon. "Our financial system has been functionally insane -- we need a sustainable capitalism." It's a message Mr. Gore as been giving over the past year, and one that seems to resonate with folks, and certainly with many in the room who were brought together by outgoing Pennsylvania Treasurer Robin Wiessmann. "The solution to the financial, environmental and energy crises we face is the same," Mr. Gore opined. "Reduce our dependency on polluting sources and troubled assets." He also suggested that we need to return to a long-term view, whether it's investing or protecting the environment. Speaking of his own firm, Generation Investment Management, Mr. Gore suggested, "We set out to prove that you can outperform by adapting sustainability principles. We asked, 'When you use the word profit, what do you mean? Ninety days? Twelve months? Or seven years? We wanted a sustained profitability." As I've written elsewhere on this blog, Mr. Gore has settled into his role as climate statesman very well. He has a kind of homespun-meets businessman demeanor that is appealing when he stays away from hyperbole. I'm concerned about his overuse of the word "crisis," for instance, and his insistence on the "facts" about global warming, dismissing questions about variations in arctic ice calculations as relying on mere "factoids." And I do wish he would stop using the allusion to the Chinese character for Crisis being "a combination of the characters for 'danger' and 'opportunity,'" which has been disputed by the University of Pennsylvania's Victor H. Mair , professor of Chinese language and literature, and which I've written about elsewhere on this blog. But he has a point when it comes to the long view. How can we expect economies, companies, or people in general to embrace sustainability when they are expected to think only of the next week, the next quarter, even the next year rather than in the lifetime of a business-cycle or a generation? Can cities save the planet? The promise and challenge of green urbanism. Global Warming Threatens Polar Bear Population? Image by christhedunn via FlickrPrez-elect Obama has wasted no time pulling together a fascinating group of people to be a part of his team, from both sides of the aisle and from a myriad of perspectives. Equally impressive is how he's been able to jump right into the mix on the economy and bring this diverse group together to hash out a plan to get the country back on track. Or so one hopes. The danger lies in what David Brooks rightly identified in this morning's New York Times as "Obama's audacious self-confidence." Members of his party are questioning such a large tax cut in the stimulus package. And Republicans are concerned about some of the larger spending components, such as $200 billion to states targeted at expanding the federal share of Medicaid. In other words, business as usual in Washington. Given all this, it will be interesting to see how the dialogue unfolds over the next couple of months. Will tax cuts and increased government spending turn out to be a winning combination? It hasn't thus far, but who knows; Mr. Obama may yet have the Midas touch. More troubling is that the stimulus package also appears to be more of the same: bailouts, building, and a whole lotta hope. Of course there is a modicum of new initiatives thrown in, such as broadband projects, a new power grid, and new scientific research, as well as an intriguing business tax package. The good news, from the new green economy perspective, is that Mr. Obama still seems committed to alternative energy and energy efficiency. He proposes to "double the production of alternative energy within three years" and "modernize 75 percent of federal buildings and improve energy efficiency in 2 million homes." The former is wildly ambitious, given how difficult it is to get energy-related projects off the ground and the latter doesn't seem to be exploiting the opportunity efficiency affords. In other words, it may not be ambitious enough. And while many roads and bridges are in need of repair, it strikes me that this is Mr. Obama's way of pandering to state governments in order to secure their votes for the plan. I tend to agree with my blogging and StockTwits pal Gregor Macdonald that there are larger gains to be had from investments in light- and commuter rail in many of America's metropolitan areas. However, I also understand that we are a people and a culture defined by our cars. It took 50 years to make us this way; and it may take another 50 -- and astronomical oil prices -- to change us. Another blogging buddy, Shari Shapiro over at Green Building Law Blog, makes a very good point about "putting the first dollar of tax payer money into the most cost-effective initiative, to ensure those initiatives that have the greatest cost-benefit calculus get funded first and most robustly." Shari's conclusion, with which I agree, is that "energy efficiency efforts work with the rule of the first dollar." The Obama stimulus may not be as heavily weighted towards efficiency as we'd like to see -- and that may be a failure of imagination about how to engage the states. Finally, as Brooks points out in the Times, while "there is wide support for fiscal stimulus...there is no historical experience to tell us how to do it, and there is no agreement on how to make it work." In the end, I hope Mr. Obama isn't setting himself up for failure by trying to bring a compromise to the table before the table has been set or by biting off more than he can chew before dinner is served. Perhaps Mr. Obama has the magic to make this work, but I, like Brooks and others, remain skeptical. "By this time next year," Brooks concluded his editorial this morning, "he'll either be a great president or a broken one." Image via WikipediaSatyam means 'truth,' in Sanskrit. But truth is the scandal involving the Indian IT giant is the latest in a string of ethical lapses in business. The scandal at Satyam Computer Services, a leading Indian outsourcing company that serves more than a third of the Fortune 500 companies, points to a moral bankruptcy among our business leaders. And it raises the question of how many other companies -- public, private, and even non-profit -- are cooking the books or manipulating their balance sheets to give the appearance that their performance is better than it is. Ironically, Satyam had been awarded last year's Golden Peacock Global Award for Excellence in Corporate Governance 2008. Excellence at fraud, manipulation, and malfeasance is more like it. What due diligence was done by the body making such an award? Satyam's chairman and founder, Ramalinga Raju, resigned after confessing to falsifying accounts and that 50.4 billion rupees (US$1.04 billion) of the 53.6 billion rupees in cash and bank loans the company listed as assets for its second quarter, were nonexistent. That is no rounding error, it's a blatant lie. How do people like Raju and Bernie Madoff and others think this kind of behavior is acceptable? We have evolved into a culture of success at any cost. And our children are following our lead. Last year, a survey in by Rutgers' Management Education Center of 4,500 US high school students found that 75 percent of them engage in serious cheating. Even more disturbing is the fact that 50 percent of respondents to the survey said they don't think copying questions and answers from a test is really cheating. We need to send a message to our leaders and to our children that getting ahead by cutting corners, cheating, and lying is not rewarded. We need to get back to basics and encourage an ethic of truth and transparency. Winning at all costs is not acceptable behavior. Why Are Madoff Investors Special? 2009 brings some new incentives for homeowners to adopt energy efficiency from both state and federal sources. The Wall Street Journal reported last week on several of these, including new provisions for tax credits in solar, small wind, and biomass stoves (those burning wood pellets or corn). In addition, this year, both solar and wind residential tax credits can be claimed against the alternative minimum tax. Improvements to weatherize your home could also qualify for an energy efficiency tax credit of up to $500. There are also new credits for upgrading your furnace, boilers, heat pumps, and water heaters.